The days are blurring together already. We arrived in Prague late Sunday afternoon (Sunday? Yeah, Sunday, that was it), after taking a coach from Budapest. We’d had to get up early to catch the coach at 7:30 a.m. (including dragging the luggage two blocks to the pick-up spot) and while some in the group were ready to take on the City of Spires, the Reverend Mother and I were thinking nap and a chance to catch up the short sleep from the past week, month, week – whatever. 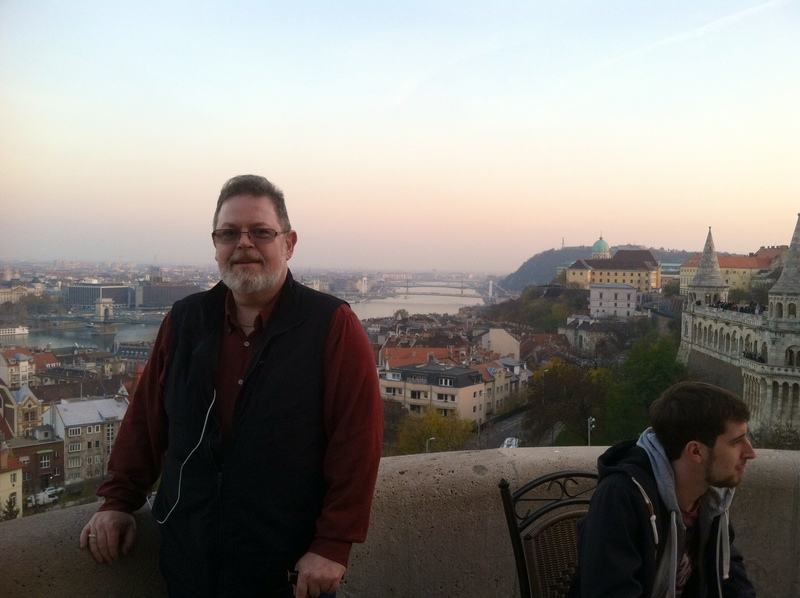 Anyway, no blogging Sunday night but I wanted to share some images from our Saturday “Danube Bend” tour. We saw some interesting villages and countryside, to be sure, but there was also some interesting political and historical dialogue with our guide, similar to what we’d experienced the previous day with another guide … and all a prelude to what we’d hear on our long ride Sunday. I want to tie all those together in a later post. For now, here are Saturday’s photos, and tomorrow (tomorrow? Probably tomorrow?) I’ll take you through our first day in Prague. 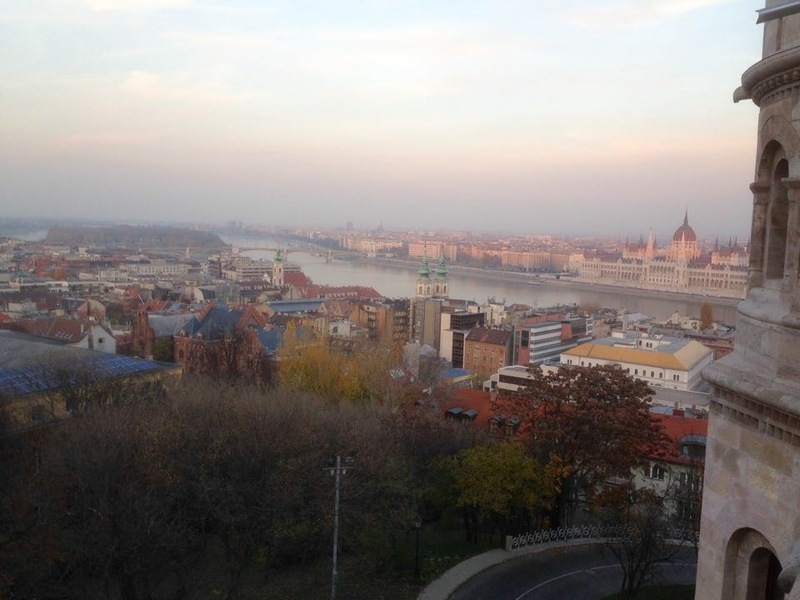 A view of the Danube, from the Hungarian side, looking to Slovakia. 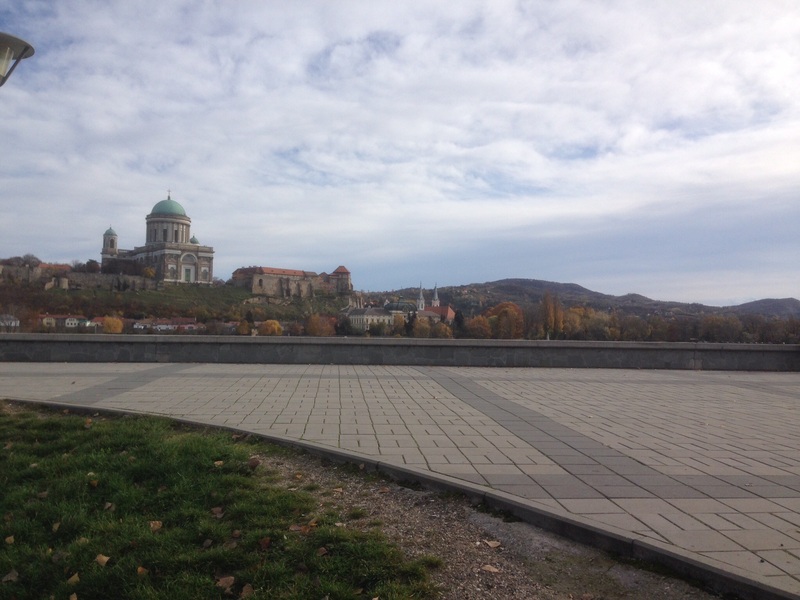 The Basilica at Esztergom, viewed from the Slovakian side of the Danube. 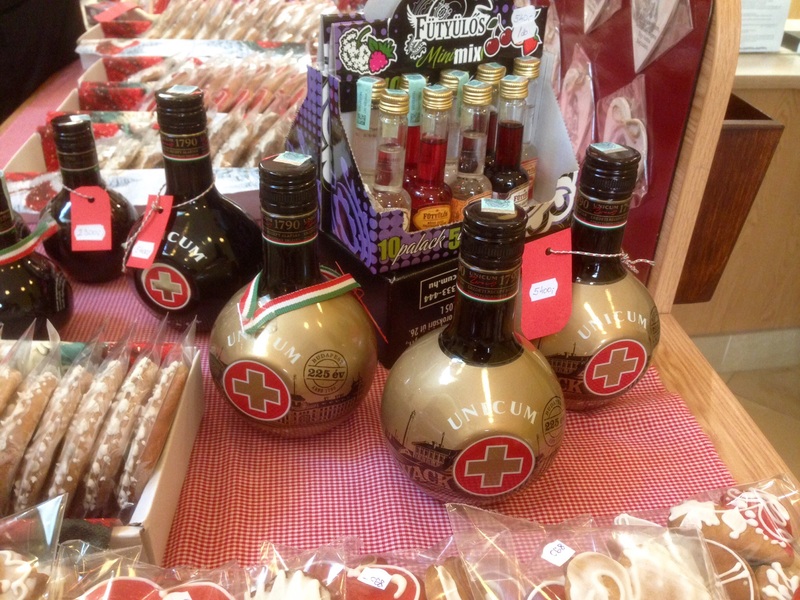 The Basilica gift shop appeared to be selling Holy Hand Grenades of Antioch. Three was the number of counting. 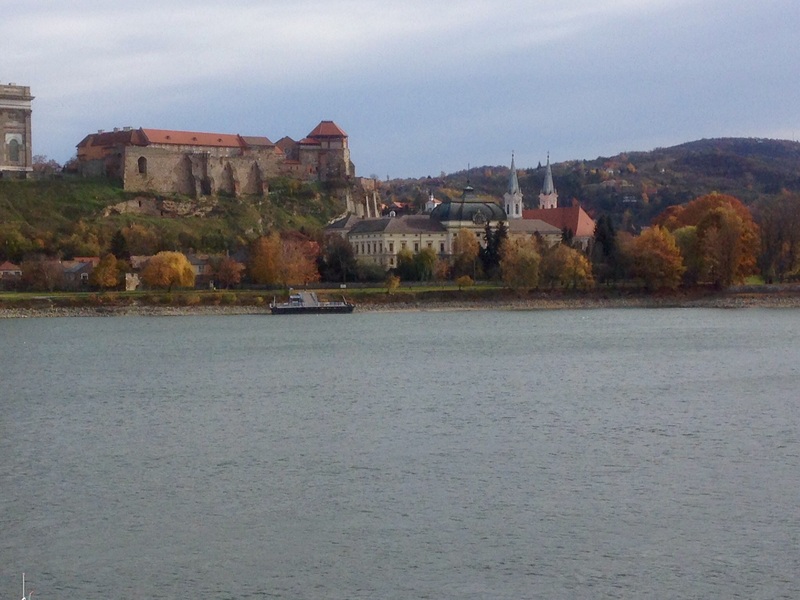 Another view of Esztergom from across the river. 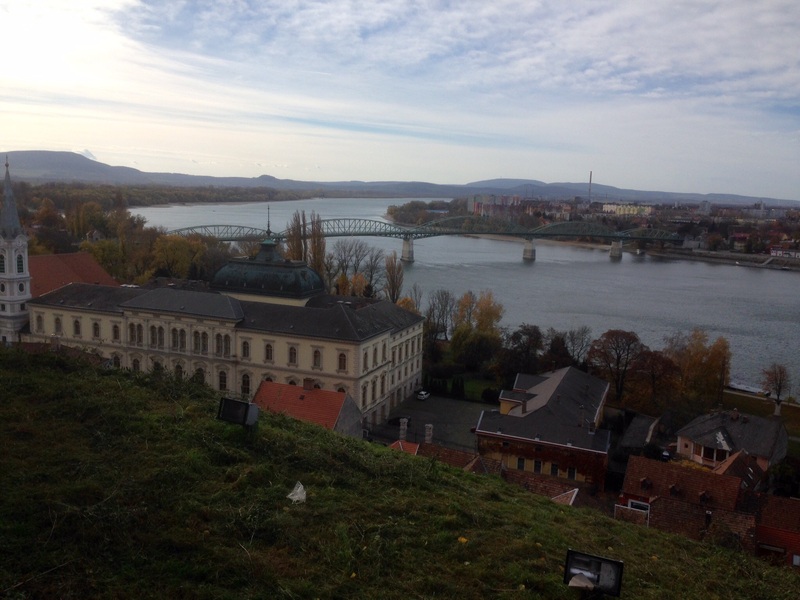 Esztergom from the Basilica’s courtyard. 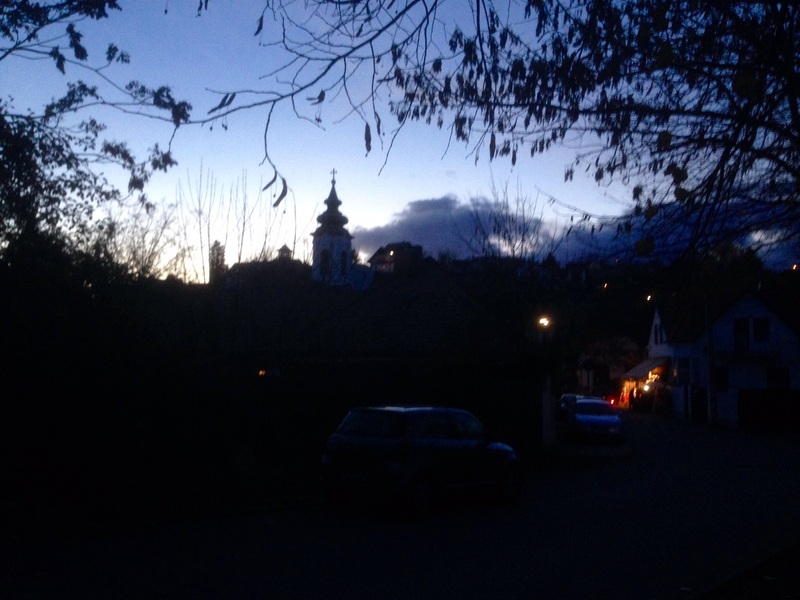 Night falls over the Hungarian village where we stopped for coffee and crafts. 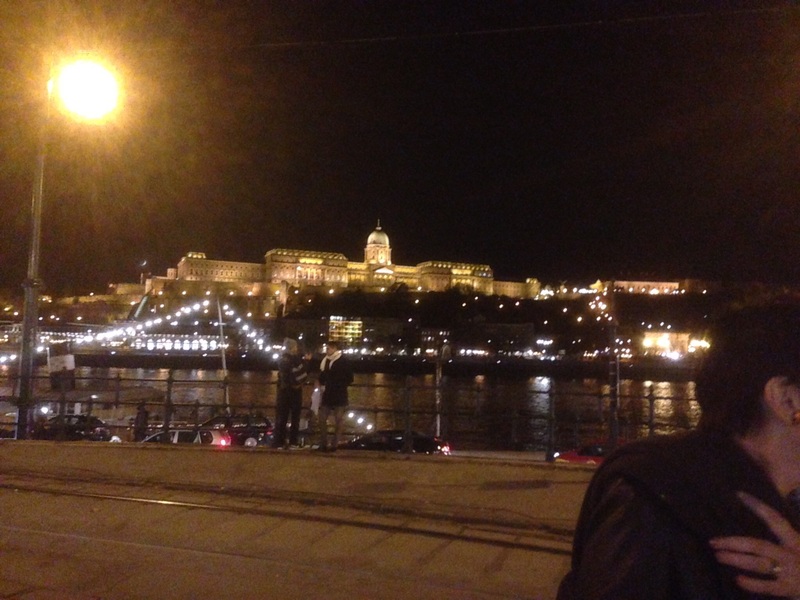 By the time we returned to Budapest it was fully dark, but it gave us a chance to get a photo of Buda Palace at night. Our first glimpse of Budapest was from the airplane window as we prepared to land. It was 9:00 p.m., so there wasn’t much to see in the dark but the lights of the city. Even so, there was something almost magical about it as the jewels below weren’t in regimented grids, but appeared as whimsical whorls of some kind of electrical paisley. 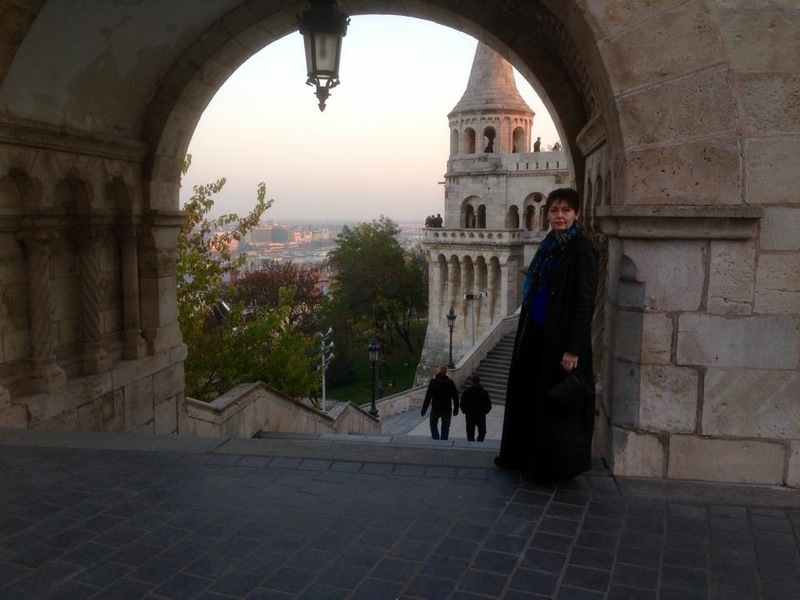 Morning brought a strange mix of sun and fog, and Marjorie and I walked the mile to Danube from our hotel. This was inspiring for a couple of reasons; one being that a year ago my walking limit was about half a mile. When we got to the river I found a shady bench while Marjorie decided to walk up to the Freedom Bridge, back down the other side and to cross the bridge nearest me for her morning exercise (this was another five miles – stats provided by her Fitbit watch). The temperature was very pleasant, in the upper 50s, and I was quite comfortable sitting by the jogging path that runs alongside the river. As an observation, there appears to be 8 women joggers for every male runner that went by. I also saw several people go by with their dogs, none of which were on a leash. 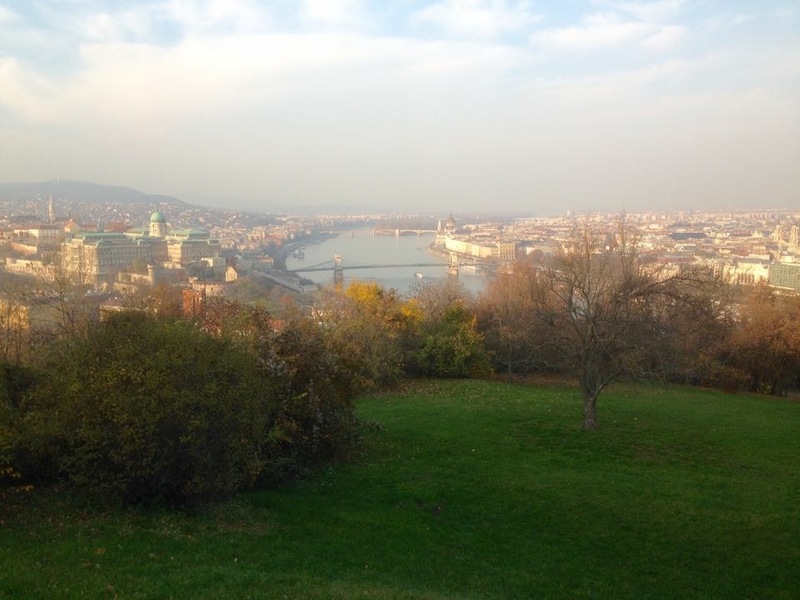 It was a kind of foggy day, but we had a great view of the city from a hill overlooking Budapest. 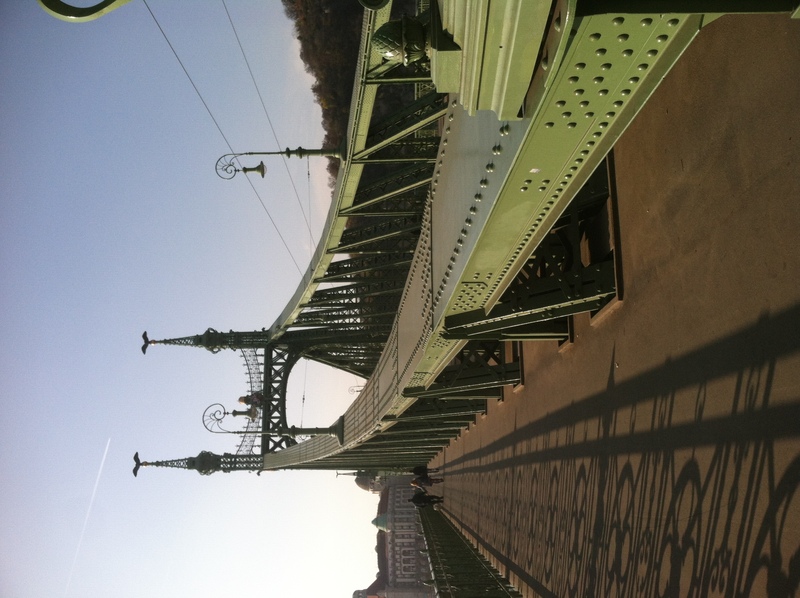 Below is the bridge Marjorie crossed, beneath the “Liberty Monument” (see caption for the irony that accompanies the iron). 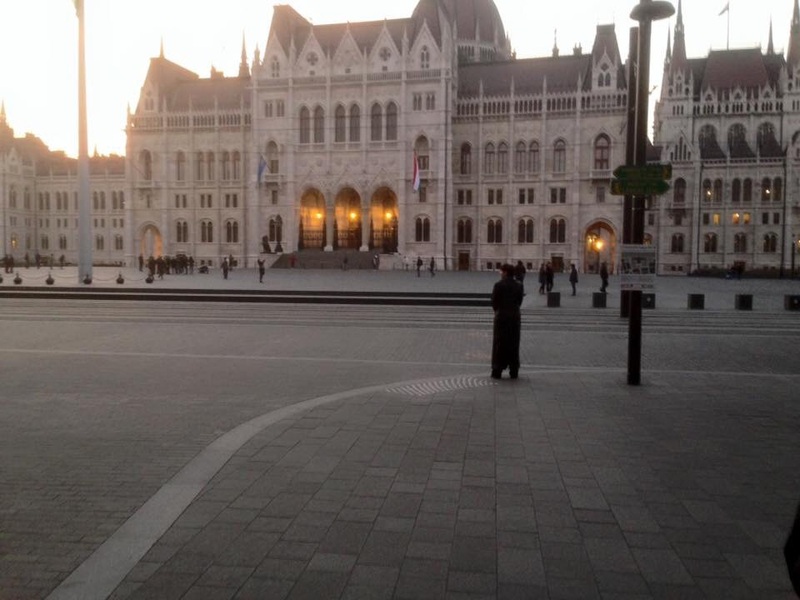 There is still no love lost between the Hungarians and the Russians. Our tour guides were pretty blunt about their feelings – without any prompting – about the Russians, and worked some rather arch comments into their descriptions of many of the sites we visited. I’ll probably share these observations and my related thoughts in a later post. We had fun storming the castle! This archway from the courtyard frames a great view of part of the castle and Pest below. And Marjorie, of course. 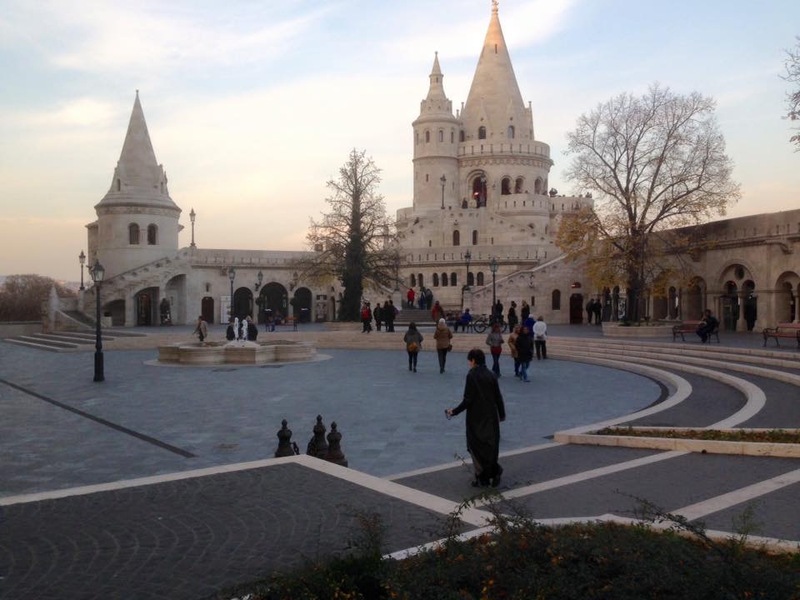 Buda Palace commands the city – and your respect. It is beautiful in form and function, projecting both power and a certain grace. The sweeping lines of almost luminescent walls speak of the power and the perspective of the past, and are more than a little reminiscent of the White Tower of Ecthelion. We easily could have spent much, much more time here. Unfortunately, our route didn’t afford us a good photo op of the outside of the castle this day, but I’ll try to rectify that. You can get a sense of it from these photos, however. Another view from inside the castle’s courtyard, looking at stairs leading to a tower. Marjorie goes to the bathroom. (Rather, she’s on her way, following the signs.) It’s important when traveling to know the word for “toilet” in any language. In Hungarian, it’s “Toalet”. 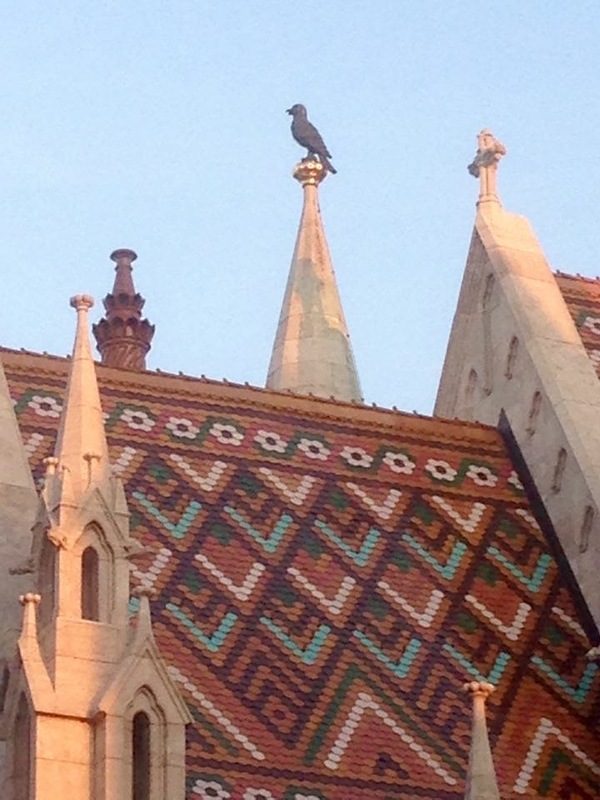 That black bird is a raven, symbol of Matthias’s house – and a close cousin to Marjorie’s crows. King Matthias is also the one who imprisoned Transylvania ruler Vlad Tepes (the model for Count Dracula) for 30 years – for tax evasion, not for being a mutilating, mass murderer. Say, there’s another awesome view. There’s more to see than just castles, of course. Here’s another panorama to wrap up this day’s adventures. 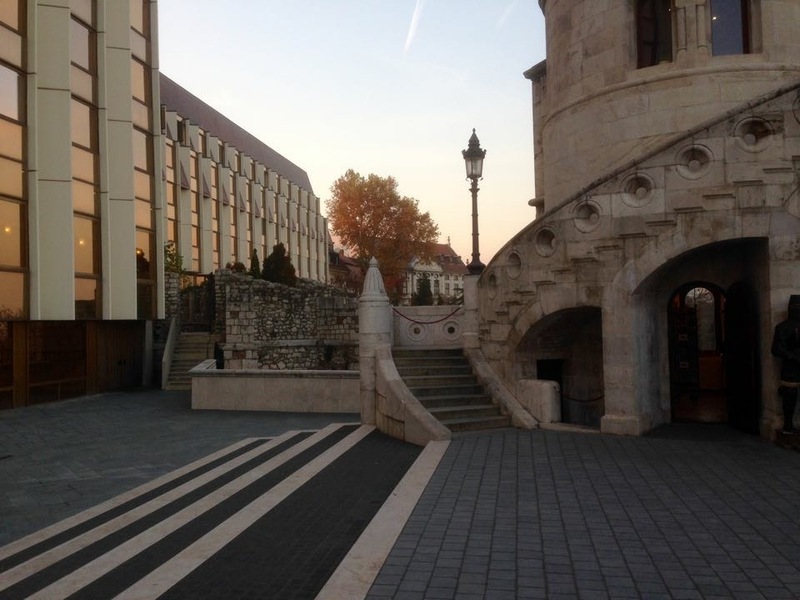 On Saturday we took a bus tour into the country – and into another country, Slovakia – to see some more sights. More to come. By the way, if you see George Ezra, we saw a number of houses for sale (“Elandro”). 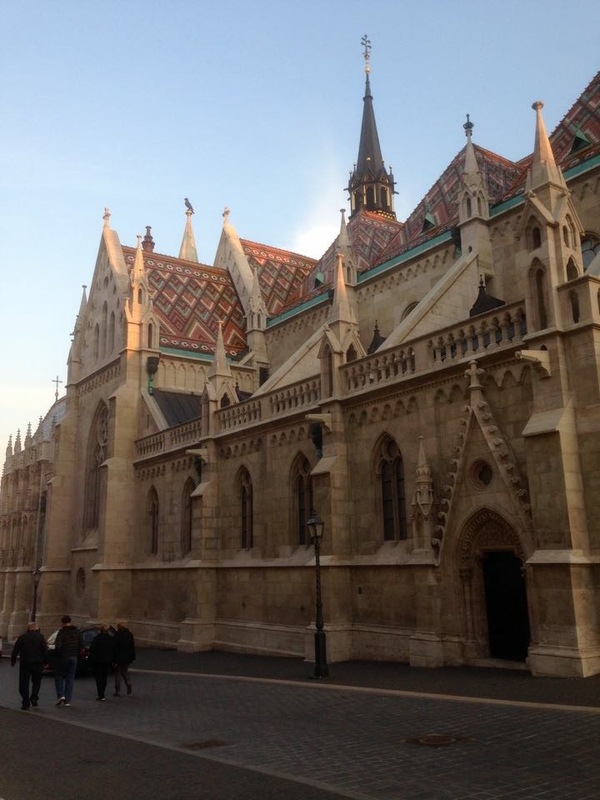 For a little more insight on how we ended up in Budapest, and why, go here. 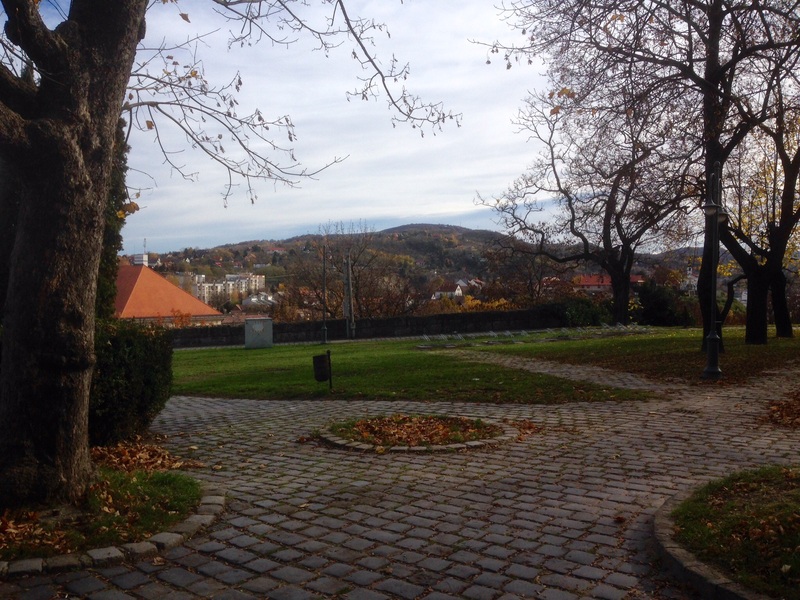 Another panoramic view, this one from one of the walls of Buda Palace.